About 45 percent of all eligible voters fail to show up to the polls for general elections in Kansas. A diagnosis of what’s wrong with our democracy points the way to more than just technical fixes to the problem. From the age of 15, Kasey Anderson knew she wanted to become an accountant – “What 15-year-old ever decides, ‘Hey, I want to be an accountant?’” she jokes – and waitressed full-time during college to pursue that dream. This August, the Wichita native graduated from Kansas State University with a double major in accounting and finance and a minor in economics, and this fall she’ll move to Georgia with her boyfriend, who’s in the military, and plans to go to grad school before working in her field. Some of her views are Republican, some Democrat, and she’s spent a good bit of time talking politics and voting – a “hot topic” – with friends. “I think it is very important to vote,” she says. Still, Anderson doesn’t plan to go to the polls to vote in the November general election. “I just finally decided that no matter how many people tell me I’m a bad American for choosing not to vote, it’s my own personal decision, and it doesn’t mean I’m not going to vote forever,” she says. Our frequently ugly, hyperpartisan electoral process is increasingly an insiders’ game. Those of us with strong beliefs or partisan loyalties need little incentive to show up to cast ballots each cycle. But if you’re one of those who falls in the middle of the political spectrum, who doesn’t feel like your views fit neatly into a major political party or who doesn’t follow politics like a sports fan, sitting on the sidelines can seem increasingly attractive. Volunteering, donating or standing up for a cause you believe in via a hashtag can feel good and meaningful, without forcing you to compromise your values in the process. If you can do that, why wade into the dirty trenches of politics? Facing that question, many young Kansans are choosing to opt out of politics rather than join in. In fact, the gap in engagement between young and old voters in Kansas has been one of the widest in the country. Young adults turned out at a rate of 38.3 percent in 2012, the last time Kansans voted for president. Those age 30 and over turned out at a rate of 70.3 percent, according to estimates from the U.S. Census Bureau. But an aversion to politics – as messy and unsatisfying as it often is – comes with a cost. It may actually limit the amount of change you can create on a given issue over time, no matter how much personal energy you put into a cause. WHO ARE THE MISSING 45 PERCENT? Millennials are by no means the only Kansans wary of politics. Many Americans, in general, dislike the conflicts and compromises that come along with democratic governance. But the problems of voter disengagement and dissatisfaction are increasingly drawing more attention. Are voters such as Anderson – reasonably informed, inclined to vote but either so turned off or just plain unmotivated to do so – canaries in the coal mine when it comes to the health of our democracy? Year in and year out, millions of eligible Americans pass up the chance to vote – the participation rate has been dropping since 1964. In Kansas, nearly half of the state’s eligible voting population has stayed home on average over the past seven general elections. The vast majority of the state’s citizen nonvoters – an estimated 640,000 people in November 2014 – are not registered to vote. Another estimated 391,000 Kansans were registered but didn’t turn out to cast a vote, according to the U.S. Census Bureau. If those estimates for 2014 are accurate, then the state’s pool of nonvoters – both registered and unregistered – exceeded the number of actual voters by 69,000. 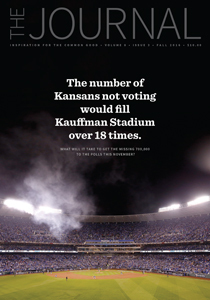 That’s right – Kansas may have had more eligible people not voting than voting that year. That’s likely to change in 2016, a presidential election year, in which nearly 60 percent of the state’s eligible population votes on average. Considering the sheer numbers of nonvoters, it’s worth asking the question: Why do so many people opt out of one of the most basic ways of shaping our democracy and our lives? And is there anything we can do to persuade more of them to opt in? If you’re looking to understand the state’s nonvoters, Wichita’s Fairmount neighborhood is as good a place to start as any. Fairmount is a diverse, lower-income neighborhood just south of the campus of Wichita State University, part of a census tract with low voting rates. On a sunny spring day, I walked the neighborhood, along with an editor, to interview a handful of people about whether they vote – and if they’ve opted out, why? From national research, I knew that nonvoters are likely younger, come from minority populations or have lower incomes. But the research also tells us that there’s not just one type of nonvoter. There’s no single reason for people choosing not to vote, nor is there just a single barrier that can be eliminated. When Northwestern University researchers looked at nonvoters in 2012, they found that some are pessimistic about politics and government, others are too busy or overwhelmed by economic concerns, and others have simply tuned out and turned their attention elsewhere. I ran into people who reflected those sentiments in just a brief walk through the Fairmount neighborhood. “Everybody says it counts, but it doesn’t count,” says Joe Brown, a Wal-Mart employee in his mid-50s who won’t vote this year. Nearby neighbors who do intend to vote expressed ambivalence. Joseph Graybill, a young engineer with Textron Aviation who’s lived in the neighborhood since attending Wichita State, is concerned about pro-life issues and intends to make 2016 his first presidential election, but he’s not overly excited about his choices. Eleanor Brown, taking a break from preparing a flower bed next to her front porch, said she always goes to the polls because “if you don’t vote you don’t get a say.” But this year, though she’ll make a choice, the selection isn’t “clear-cut” like past ones. Pessimism, cynicism and ambivalence, to name just a few sentiments, appear to be driving Fairmount residents away from politics, or at least making them far less excited about taking part in it. And while each nonvoter’s story is unique, what these individuals say seems in line with what’s going on with nonvoters just about everywhere. But the antidote to their disengagement remains elusive. States with high voter turnout – such as Alaska, Maine, Minnesota, Oregon and Wisconsin – do tend to share some common characteristics. First of all, as political scientists like Michael P. McDonald told The Christian Science Monitor in 2012, they make voting easy in terms of registration and turning out. They put conscious efforts into educating residents about voting and how to do it. They often tend to have deeply rooted political traditions for voting and civic participation. And finally, they hold interesting, competitive elections that people actually want to turn out to vote in. But there’s no magic formula to change a state like Kansas – which ranks near the middle of the country in turning out eligible voters – to a high participation state such as Minnesota, where two-thirds of eligible voters have turned out on average in recent elections. Changing the equation will require us to wrestle with conflicts over competing values and deal with fears that changing who votes will, instead of improving democracy, give a particular party or political ideology a decided advantage at the ballot box. What you want to do about the problem of low voter participation depends a lot on what values you hold the highest. What do you see as a greater threat to democracy? The lack of enough voting? Or too much of it (by uninformed or ineligible voters)? Some operate under the assumption that more people voting is a good thing, while others ostensibly believe that the voting system is easily corrupted by fraud or best directed by the most informed and partisan voters. Let’s sift through those two broad groups and take a closer look at some of the perspectives on voting and turnout. One will find techies and structuralists, individuals and groups who advocate for technical changes designed to boost turnout, such as more voting by mail, choosing your own polling station, longer Election Day hours and perhaps even online balloting. For this faction, increasing voting is a technical challenge that can be addressed with policies that make the simple act of voting more convenient. Colorado, for example, went with a mix of approaches in 2015, when it began mailing ballots to registered voters, who can mail or drop off their ballots at any polling center in their county. Then there are security guards like Kansas Secretary of State Kris Kobach, who advocates for more controls on voting to prevent such activities as voter fraud (which, although apparently rare, remains a significant concern for many conservative Republicans). Among the guardians’ approaches are requiring registered voters to present picture IDs at polling stations, tightening rules for advanced ballots and obtaining the ability to prosecute voter fraud, a power Kobach has that is held by no other secretary of state in the country. Kobach’s efforts so far have yielded at least four convictions, all misdemeanors. So far, none have been noncitizens. There are also registrars, who focus on the importance of getting people signed up to vote, and increasingly want this to happen by default. They often seek such policies as same-day registration, early registration for 17-year-olds and automatic registration, where if you get your driver’s license you must opt not to register to vote instead of having to consciously say, “Yes, I do want to register.” Oregon instituted the approach in 2015, adding as many as 400,000 potential voters to the rolls. One will also find overhaulers, who see the problem in terms of improving the choices that voters have and advocate steps to increase the candidate pool and the number of options available. That can include steps to foster third parties or institute multiple-official districts, as the Illinois Legislature had for more than 100 years. A top-two primary system – in which the top two vote-getters regardless of party advance to the general election – is another overhaul effort, implemented in states such as California. Finally, there are engagers and educators, who aim to convince people that they have a stake, should vote and could make a difference. They usually have a good bit of techie and registrar in them, as well, but hope that information, newly realized self-interest and belief in the common good can drive people to learn about the issues and the candidates, and then act on that and vote. Almost all of these perspectives assume that voting is in and of itself good, which is a viewpoint that’s not universally shared. Some believe that there are some eligible voters who shouldn’t be voting because they’re not motivated or knowledgeable enough to make informed decisions. Others contend that when someone chooses not to vote they’re making a choice that’s just as morally acceptable as when someone chooses to vote. The sheer complexity of changing voting habits in our country – and the inadequacy of technical solutions alone to do the trick – played out in an interesting 15-part series on voter turnout that ran in the Stanford Social Innovation Review, a quarterly publication of the Stanford Center on Philanthropy and Civil Society. Enlisting political and social scientists, activists and others from across the spectrum, political and otherwise, the publication scrutinized the issue from a host of angles. The series’ title, “Increasing Voter Turnout: It’s Tougher Than You Think,” said it all. It’s an issue where technical solutions involving registration and ease of balloting run smack into a wall of people’s motivations and views: You can make it easier for people to vote, but you cannot make them vote, because they first must be convinced it’s worth their while. Adam Berinsky, a political science professor at the Massachusetts Institute of Technology, used Republican presidential nominee Donald Trump as an example of how voters are drawn to the polls. “His voters aren’t showing up because it’s easier but because they’re energized,” Berinsky says. “For a lot of people, politics is something boring and removed from their daily lives,” says Berinsky, who contributed to the Stanford series. “Most people most of the time don’t pay attention to politics. But sometimes they pay a lot of attention. When times are bad, when there are high stakes, you can create political junkies. But finding candidates or groups willing to consistently put energy into that kind of widespread engagement is rare. As detailed in books and studies, the level of data available about voters and their likely preferences allow campaigns to microtarget the electorate, allowing them to woo one voter to the polls through a well-timed postcard or doorstep visit while ignoring the neighbor who might get angry and come out to vote against them. That has likely only exacerbated one of our political system’s big problems: The players pick and choose specific groups they engage with around politics, while others end up getting left out. But individual factors matter, too. Some people are just more willing to sit down and make the effort to understand the issues and the candidates because they have a clear reason why it’s important to them. Others – and there’s a faction of Kansans who simply hate politics and the gridlock that comes with it – can’t be bothered. Kasey Anderson, a Wichita native who recently graduated from Kansas State University, says she doesn’t plan to vote in this November’s general election. But it’s clear that what we’re doing isn’t doing much to solve the problem. In fact, research on such common get-out-the-vote techniques as mailers, phone calls and front-door visits shows that those approaches only modestly increase turnout, and the methods overwhelmingly focus on existing or lapsed voters anyway – not the missing half of the electorate. Berinsky’s research has convinced him that – even though he doesn’t have the answers – we need to change how we think about the challenge of low voter participation. “There are no easy solutions, and that’s why I think the focus on voting costs was not just misguided, but also I think it might have taken us down a bad path. The solution is easy – just make it easier to vote – but we’ve done that, and it hasn’t changed. So clearly that wasn’t the right problem to focus on,” he says. Anderson, the recent K-State graduate and future accountant, plans to vote in the future. She has concerns about the role of money in politics – “I just want people who actually want to make America great and don’t want to either make themselves more money or do it for the publicity” – and about the complexity of registering and participating in the election system. But more than anything she wants to have a better grasp of the system before taking partin it. “I want to give myself a little bit more time to mature in my own mind so that I can make educated decisions down the road for our country,” Anderson says. The problem is that if young voters don’t start showing up from the get-go, they often don’t ever show up. “We know that young people, if they form voting habits, they form them early. From that first election at 18 on through the college years, if you don’t start voting then, then you don’t usually vote later in life,” Crane Childers says. Getting young people to develop a positive relationship with the political system is one way to bring them aboard as voters. Getting them exposed to government processes early on, and giving them the civic education they need to understand how and why those processes work, might give young people a sense that politics can actually work and that their voting and participation do matter and can affect their lives and the lives of others. Yet at the same time, she conceded that if something were to spur her to take part, it would possibly be matters affecting her young daughter, who began walking in the spring and who, along with work, consumes her time and energy. One way more voters could develop positive views of politics is by getting more involved at the local level first. “A lot of times, people think they’ve got to participate in state or national politics,” Loomis says. Chapman Rackaway, a political science professor at Fort Hays State University, sees a leadership opportunity for those in authority, such as governors and education officials, to elevate the importance of an informed and engaged citizenry. If we want young people to appreciate politics, we have to value it enough to give them a realistic and inspiring picture of what it involves. In fact, all of us – especially the most politically engaged – need to take a look in the mirror. The way we engage in political activity – on social media and otherwise – likely contributes to the problem of voter disengagement. Our detest for the other side and an unwillingness to question our own increasingly rigid views contribute to a political climate where there’s little space for nuance or exploration, the very things nonvoters – especially younger nonvoters – might need to be doing right now. With every snarky Facebook post to our choir of friends, we’re contributing very little to the conversation. In fact, it’s not much of a conversation at all. Striking back at ugliness in politics isn’t something we can wait for the candidates or someone in authority to do. And it isn’t a problem that’s going to be solved by laws, as worthy as they are, that make voter registration easier or by mail ballots or similar changes. Doing things differently could be your own personal act of civic leadership. Maybe our lawmakers will even follow our lead. So the next time you make that social media post or share a political opinion, remind yourself how important it is to keep an open mind and consider multiple interpretations when talking with friends and family about politics. Be curious about what others think, and, if you can’t do that, be curious about your own opinions and why you react so strongly to certain views. Sharing political views – and even debating hot issues – in productive ways could help make Kansas the kind of place where voting and politics are more valued and less shunned. Because the truth is: how we conduct ourselves politically influences those around us. This entry was posted in Civic engagement, Uncategorized, Voting. Bookmark the permalink.